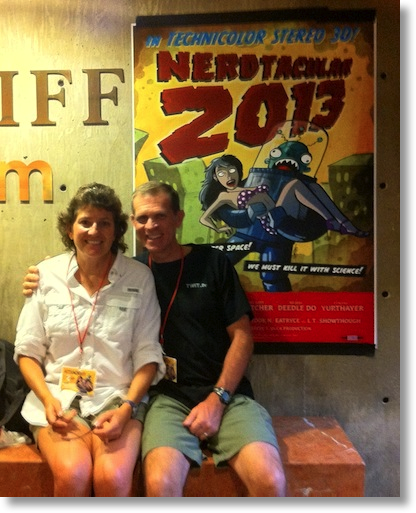 Steve and I spent the week at Nerdtacular, Kirschen Seah tells us about AppCamp for Girls IndieGoGo Project, Yadiel Sotomayor gives us his first review, this time of the new Macbook Air, and Jim Sewell tells us a great tip about how to combine TextExpander with the Terminal. in Chit Chat Across the Pond Bart takes us into Taming the Terminal, Part 5 of n.
Hi this is Allison Sheridan of the NosillaCast Mac Podcast, hosted at Podfeet.com, a technology geek podcast with an EVER so slight Macintosh bias. Today is Monday July 8, 2013 and this is show number 426. 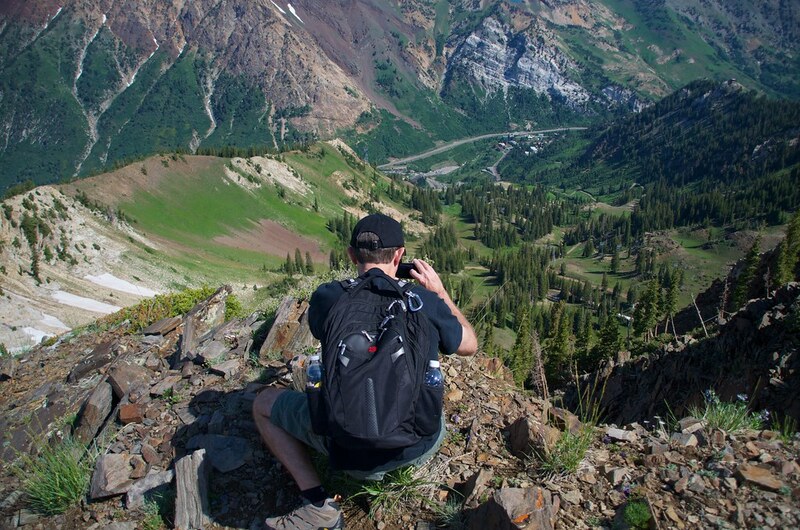 The show is out a day late this week because Steve and I just spent 5 days in the gorgeous resort of Snowbird, Utah to attend Nerdtacular. I hope you got the memo, I tweeted it a bunch of times and sent out the NosillaCast News about it a week in advance (hint hint). Before we went, we really had no idea what Nerdtacular was. We had dinner with Tom Merritt a few months ago and he said we should go so what the heck? We found out that Adam Christianson of the MacCast goes, and that was enough for us. So what IS Nerdtacular? It’s a conference that Scott Johnson puts on for the fans of his Frogpants Network series of shows. Scott is a cartoonist, and a full fledged nerd himself. The sessions were about all kinds of nerdy things – with topics from PC games to console games to science fiction, but not as much tech as I thought there might be. Scott has about a zillion shows that he puts on with hilarious co-hosts like Brian Ibbott of Coverville, The Turpster who’s main function in life appears to be making people laugh, to Tom Merritt, to Justin Robert Young, to Veronica Belmont and the list goes on. If there’s one thing everyone on stage had in common it was that they were hilarious, every single one of them. One of the biggest impressions I’m left with from Nerdtacular is the overwhelming friendliness of people at this conference. Maybe it’s because we’ve all been that uncomfortable dork that no one would talk to at a party and so we’re all happy to find friends to play with. Our first night we went to a bar and saw a guy named who looked like he would fit in at Nerdtacular, invited him to our table and he was wonderful. We don’t know anything about video games so we asked him to explain World of Warcraft to us. I’m not sure I can tell a horde from a guild but he was so patient with us and didn’t do that snotty, “YOU don’t know what a troll’s powers are?? ?” kind of thing that I find way too often in life. Ok, it’s not normally about trolls but you know when you ask a question and someone repeats back to you with “you don’t know…” at the beginning? No, I’m asking because I want to see if I can get people to tell me something I already know. The next day we sat down with Kelzy and Dane and again the nicest people you could hope to meet. They again were patient with us explaining games and why people are rabid about one vs. another. The next nite at dinner there was a couple behind us in line to get into a restaurant and we simply invited them to join us – and yet again nicest people ever. Wish I could remember their names, I think it was Rebecca and a guy who goes by @LogoLarson on Twitter. I think Scott Johnson sets the tone for why everyone is so kind – he’s very warm and engaging and simply loves making people happy. He was constantly thanking his family (his mom was there) and the fans and you could tell everyone ate it up. According to Kelzy this fan club came up out of nowhere (kind of like the NosillaCastaways) that call themselves the Tadpools, get it? Frogpants Network, Tadpools? Board games are HUGE at Nerdtacular. There’s a room with games set up all day long where people are hollering and yelling and strategizing and generally having a good old nerd time. I think one of my favorite sessions was the live filming of Film Sack which is a show that Scott and Brian Ibbott do where they pick apart a movie, evidently often a bad movie, making fun of it in a goofy way including clips from the movie. This one was very visual since we were there live, but normally it’s an audio podcast. the movie they did was Star Trek 3, The Search for Spock which I’m pretty sure is my least favorite Star Trek movie, so I really enjoyed the mockery. Steve and I both plan to subscribe to Film Sack from now on. We also got to see a live show of Veronica Belmont and Tom Merritt recording Sword and Laser, their science fiction reading podcast. It was pretty fun to watch and learn about a lot of books – I left there feeling like I don’t hardly read at all! They were each reading about 4 books simultaneously, which would drive me nuts. I’m a one book at a time woman, can’t stand to have two going! A real surprise to me was how many nerd women were there. I’m used to maybe 10% women at real tech conferences, but this was probably 30% women. I remember thinking one morning that I would REALLY rather carry my backpack than my purse, but I didn’t want to look like a dork. And then I realized, “hey, we’re ALL dorks here!” Do you realize what kind of freedom that gives you? I actually felt a little out of place because I wasn’t dorky enough. I wasn’t wearing a logo shirt with joke on it that only people “in the know” would get. Oh well, I can learn this, right? The final act of Nerdtacular was Brian Brushwood doing his magic act. If you EVER get a chance to see Shwood doing his act, absolutely drop everything to go. He eats fire, he demonstrates ESP, he cuts his tongue off AND drives a nail into his nose. How could you pass up something like that??? Steve is posting a series of videos from filming Brian’s show. The first one which is when he breathes fire, is up at youtube.com/watch?v=l88onWCgJG0. If you want to see future videos as he releases them subscribe to our NosillaCast channel! Hi! I’m Kirschen Seah. Many of you would know me from my reviews here and website FreeRangeCoder.com. Last year, Jean MacDonald, whom quite a few of us know from Smile Software, launched a project called App Camp for Girls, link in the show notes. (appcamp4girls.com). The camp is launching later this summer. Girls will learn how to brainstorm, design, and build an iPhone app, working with women developers at this one week program. We’ve launched an Indiegogo campaign, link also in the show notes, (indiegogo.com/projects/app-camp-for-girls) which started the first week of June to raise $50,000, which is intended to cover the first year of building a nationwide non-profit program. That fund raising goal was reached in just three days! Thanks so much to the contributors for all your support! Right now, as we come into the final week of fund raising at IndieGoGo, we’re aiming to reach our stretch goal of $100,000. With that level of funding, App Camp for Girls will be able to accelerate plans and expand beyond Portland, Oregon to other locations. Please visit the IndieGoGo link and do consider making a contribution to this worthy cause. And if you’ve already given, thanks so much! I volunteered to help App Camp for Girls and curate AppStories.org, a companion project which posts an app related story from a developer each day during the campaign to inspire a new generation of developers. Do check out the App Stories site and share the stories with aspiring developers, especially the girls! If you have an app story to share, do send me an e-mail at kirschen@appcamp4girls.com. That’s kirschen at app camp, the digit 4, girls dot com. Once again, this is Kirschen on behalf of App Camp for Girls. Thanks Kirschen – I LOVE AppCamp for Girls and I donated to the project. I’ve been doing a lot of whining over the years about not enough girls in science, technology, engineering and math but Jean and her volunteers like you are DOING something about it! I love that the first funding goal was met in three days too – shows a lot of people think this is a terrific idea. So everyone go over to the link in the shownotes to the Indiegogo project and donate to AppCamp for Girls. Hello Fellow Nosillacastaways, this is Yadiel Sotomayor, from the beautiful island of Puerto Rico, doing a review for the new 2013 Mac Book Air. First, let’s talk about the problem to be solved. I am a student at a big university, with a huge campus, and I often carry a big heavy backpack with me. Inside this backpack I carry a portable hard drive, a Braille display, a laptop, and other sundries. And this is without factoring in my class materials. This makes for a very heavy backpack, especially when you need to carry it around all day. The heaviest thing in this backpack, of course, was my old computer. Furthermore, I was noticing my old computer’s battery life wasn’t lasting as long as it used to. So I decided, it was time for an upgrade. Why Did I Get This Computer. During 2013’s WWDC, Apple announced an updated version of the Mac Book Air lineup, and they mentioned a huge increase in battery life. This was mainly the reason why I decided to get an air. Ok, let’s take this out of the way, Apple lied to us. Apple said that the Mac Book Air’s battery will last 9 hours on the 11inch, and 12 hours on the 13inch. I have to say, this is a lie. In the last few weeks, I have been getting between 15, and 16, hours of battery life on a single charge. A lot more than what Apple mentioned in their presentation. Another pro of this computer is that it is light. On a hot summer day, on a backpack, running from class to class, the weight of this air is very noticeable. It is like it isn’t even there. Perfect for a university student. Finally, this computer is fast, how fast? Well, if I restarted this computer right now, it would only take 10 seconds to boot right back to a usable state. I even have some stats for you. From totally turned off, to a very functional desktop, on OSX, the computer takes between 5 and 6 seconds to boot. On a windows partition however, the computer takes 17 seconds to boot. Impressive yes, but Windows is less efficient than OSX. Who knew? Cons, or Bad Things About This Computer. Well, not everything is right on the state of Denmark, I mean, Apple. Not Everything is right in the state of Apple. This computer has a few flaws that I need to point out. First, the Mac Safe 2 power adapter. This thing is flimsy. It feels like a good pull will break the cable, instead of just popping it out like it is supposed to do. Another flaw about this computer is the keyboard. Even though Apple marketing materials say that the keyboard is the same as the ones in their Mac Book Pro, they are wrong. It is the same layout sure. But the keys feel shallower and squishier than the ones in the Pro lineup. Finally, this computer is not a Mac Book Pro. On my old Pro computer I could run a virtual machine with windows, and a lot of screen readers, and the computer wouldn’t even break a sweat. However, the mere act of installing a virtual machine on this computer, brings it to a screeching halt. So, I had to result on using Boot Camp, in order to run Windows in this machine. Let’s do this Leo Laporte Style, Buy, Try, or Don’t Buy. If you want a nimble, flexible computer, that can do almost everything you want it to, and you want it portable and with an amazing battery life, then I suggest a definite buy. However, with that said, if you want to edit photos or videos while on the go, or you want to render something in Final Cut while you drink your morning coffee at your favorite coffee place, then I suggest you get a Mac Book Pro instead. This is not the computer for you. You can follow me on twitter at y_sotomayor, caution though. I do not censor myself on twitter, and I use a lot of profane language over there. So if you are against that, or find that offensive in any way, shape, or form, I suggest you don’t follow me. I will not take any offense if you decide not to. Links for Mac Book Air 13 Inch on Amazon. Thanks so much for the review Yadiel. I love your style and your voice and accent are simply lovely. I especially appreciate the fact that Yadiel wrote and recorded this twice, changing it to make it even better than his original recording. I certainly hope that Yadiel does more recording! On the Macbook Air, I bought one of the new ones for my son Kyle and he would back up your claims of amazingness on this machine. I haven’t put a virtual machine on his yet – kind of tempted to do that just to see what would happen. It may be the 4GB of RAM limitation that makes it too slow to use. Thanks again for a great recording. Hi Allison and Bart, I have a tool combination I’ve not heard talked about before but on the drive home today it just made perfect sense. Bart has been giving us some great instruction in his Taming the Terminal series. The problem to solve is keeping all those pesky options straight without having to spend 10 minutes in the man pages every time you want to use the command! For instance, I know the command ls will “list” my files. What were those other options I like? Let’s go to the man page and see. Oh yes, ls -lah which is: -l long format -a all files -h human readable sizes. Ok, now I have it what do I do with it? I could write it down in a notebook, but that’s almost as bad as using man every time. I know! I can create a shortcut named .ls (notice the leading period) which expands into my command! How can I do that! I know, I’ll use my favorite tool, TextExpander from Smile Software! Just create the snippet in TextExpander and go to terminal and type .ls and you’re golden! What a great place to use my favorite tool – the terminal where there are so many pesky details to remember! In fact, I can even expand it more by making my expansion be: ls -lah | less which “pipes” the output of the ls command into a utility named less which shows a page at a time instead of scrolling mercilessly by at mach 6. This is great, Jim! I have an IronKey encrypted thumb drive that works on both the Mac and Windows, so it cost a FORTUNE. Unfortunately when Mountain Lion came along, it broke something in the way the IronKey thumb drive worked so it would no longer open. I wrote to IronKey and the guy who answered told me that there IS a workaround but only if you’re not afraid of the terminal. it’s not ideal but if I type in this very specific command, it works. The downside is that I have to put this command in EVERY time, and it’s kind of a pain to type. I used your idea and put it into TextExpander and now I can just type in my snippet and boom, the software works again so I can get to my stuff. Thanks again for sending this, awesome tip. Well thanks everyone for your patience waiting a WHOLE extra day but it really allowed Steve and me to relax in Utah and have fun with all our little nerdy friends. That’s going to wind this up for this week, many thanks to our sponsor for helping to pay the bills, Blue Mango Learning at bluemangolearning.com makers of ScreenSteps and Clarify. Don’t forget to send in your Dumb Questions, comments and suggestions by emailing me at allison@podfeet.com, follow me on Twitter and app.net @podfeet. Check out the NosillaCast Google Plus Community too – lots of fun over there! If you want to join in the fun of the live show, head on over to podfeet.com/live on Sunday nights at 5pm Pacific Time and join the friendly and enthusiastic NosillaCastaways. Thanks for listening, and stay subscribed. I have a 2011 Air. They only came with 4GB of RAM, and those models were also “afflicted” with the Intel HD 3000 graphics, actually slower and sharing RAM than the previous models with Nvidia dedicated graphics. Still my old Air runs Virtual Machines in the free Virtual Box software pretty well. Though I’ve installed Chromium OS and Lubuntu, not Windows. Allison’s observation that 4GB of RAM will slow things down is probably right, but the 2013 Airs have much faster SSDs and much better Intel HD Graphics. I’m presuming a Virtual Machine Program (Parallels, VM, even the free Virtual Box) will use the basic Mac OS ability to share to virtual memory. (Surely a feature dating back to early Windows days hasn’t been abandoned). So your VM should be offloading RAM overload to SSD. Maybe Bart could clear that up as he knows a lot about VMs. Concluding, I found no real benefit to running a VM under Mac OS. They are slower. Fun to play with, but if you need to use Windows or another OS for heavy lifting, not just testing, you are probably better off using Boot Camp. Best of luck in college with your new Air. I’ve locked my credit card up for a while, even though I passed mine to my daughter who needed a much more reliable WiFi connection than her Acer TimelineX that got her through three years of law school. Sure wouldn’t want the Acer’s recently-become flaky WiFi to flake out while she’s taking the “must pass” Bar Exam! Thanks so much George for your comment. This setup allowed me to use Microsoft Office, the only reason why I am still using Windows. And this worked fine, until I upgraded to 8GB of RAM, and I could upgrade the VM RAM as well. Before you say it, I am unable to run Microsoft Office on OSX. I use a screen reader, and for some reason, I blame both Apple and Microsoft, the OSX version of MS Office, is not accessible using a screen reader. A huge fail on Microsoft’s part. But I am getting out of topic here. So I am thinking that the RAM is not the problem, but the processor. I’ve noticed that on processor intensive tasks, this air is a bit slower than my old MBP, even though this Air is two generations above my old computer. What I am thinking of doing, I haven’t done it because it takes time, is try and format this computer and reinstall from scratch. But at this time, this is just to see if I can fix the problem, since I am discovering that having a partition with Boot Camp is a lot better than having a VM. Again George, thanks a lot for your comments. I appreciate it, and thanks to Allison for airing [see what I did there?] my review. Oh and, best of luck to your daughter with her Bar exam. I know it is a stressful time, so I hope her hard work pays off and she passes with flying colors. Yadel – Can’t solve your problem with the screen reader. Maybe Allison and / or Summer could offer help. Could your VM problem be the version of Windows you are running? Even if the “clock speed” of your new Haswell chip MacBook Air is slower than your old MacBook Pro, it is difficult to believe that would matter. Your speed gains from the superfast SSD in your new Air should overwhelm minor processor speed differences. So out of curiousity, it would be interesting to know the specs of the two Macs. Quad Core vs Dual Core? i7 vs i5? RAM? Intel HD graphics vs dedicated Nvidia? I have to stand up for BASIC which got a bit of a bad rap at the end of CCATP. The thing is that while Java is Java and PHP is PHP, albeit they come in different, linearly produced versions, BASIC was SUCH a success that it has been produced in many flavours. Why was BBC BASIC acclaimed? Because it addressed some of the traditional shortcomings of earlier versions of the language. It still had a GOTO command (as many more ‘advanced’ languages do!) but it also had structured loops and self contained functions. It was designed for education! I personally wrote some fairly extensive programs in BBC BASIC including a complete photo management application (for your physical photos) and I was aware of several successful games that consisted largely of BBC BASIC code with calls to machine code routines where fast graphics were required. I particularly remember a golf game (though not what it was called) because the BBC BASIC made it easy to hack. Want a 1 wood that can hit 1000 yards? Done! I also undetook a project with my father on the System 80 where we took a text file and output it to an Olivetti typewriter over RS-232 with the text fully justified to both margins in a proportional font. All done in BASIC. Going in the other direction, this experience got me a tap on the shoulder one day to help out a consulting firm my company was using. To put this in context, I was in my early 20s and one of the city’s top IT consulting companies (at least one of their staff) was asking me for advice on a problem because I “knew BASIC”. Trouble was this version of BASIC ran on an IBM System/36 midrange system! I’ve never seen a language quite like it since. I think it owed more to COBOL (which I am only vaguely familiar with) than anything I had or have come across. I figured out the problem simply by applying the basic principles of programming that the various other flavours of BASIC had taught me. The code got fixed and their client was happy. I think it was something about a report showing only zero values. This last story should give you pause before dismissing any language in your quest to learn. Once you have the basic principles of programming squared away in your mind, any language can be tamed – it just becomes a matter of syntax, vocabularly and limitations. Loops, conditions, functions, parameters, variables, strings, arrays – just about every language has some form of them all. I’ve personally at least fiddled with the following languages: BASIC (at least 3 major flavours), Java, PHP, Perl, AppleScript, CL, RPG II, RPG 400, Synon/2E, SQL (yes, it’s a language), Pascal, Logo, DOS batch and BASH shell. That’s what I can think of off the top of my head. And it all started with BASIC.